I never eat dessert when I go to a Thai Restaurant, because the mains are so delicious that I simply can not eat anymore!! But now that I know how yummy Mango Sticky Rice is, I’ll definitely have to leave space for it next time! This isn’t just a tasty dessert but also a great and refreshing snack or light meal on its own! The rice is infused with coconut cream and the freshness and tanginess of the mango offer an incredible balance in the flavors! Give it a try, it’s really simple..
1. In a small pan combine the coconut cream (250ml), palm sugar (2 tsp) and a pinch of salt and bring to a simmer at low heat. Cook while stirring often, until the sauce has thickened. Then remove from the heat. 2. Warm up your leftover rice in the microwave. 3. Pour half to 2/3 of the prepared coconut cream on the rice and mix well. Cover and let it sit for 10-15 Minutes, the rice will absorb the cream. 4. Peel and slice or cube your mango – not your fingers, please! 5. 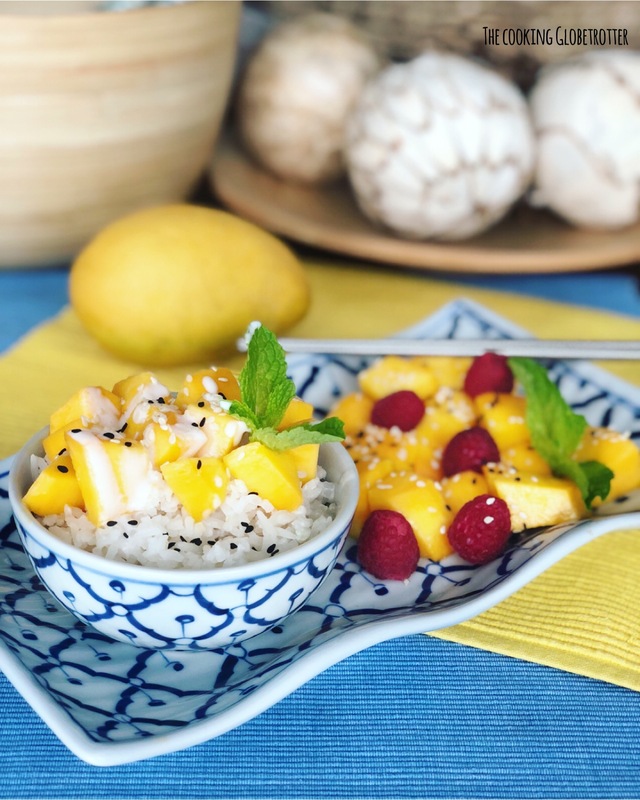 Place the rice in a nice bowl, top it with the mango (you’ll probably need just half of it), pour some or all of the remaining coconut sauce on top, sprinkle with sesame seeds and decorate with mint leaves. 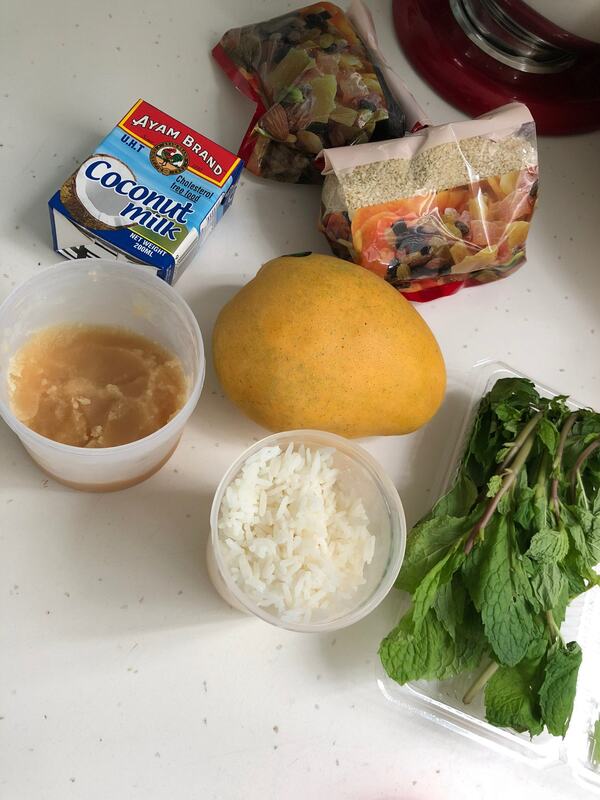 I made a small mango raspberry salad on the side and topped it with black and white sesame seeds and mint leaves. A delight!! If you have any coconut sauce left, pour it over the fruit salad and you’ll have another amazing treat!! Enjoy this Thai dish with some of the mains I published! How about a green chicken curry? Get your Jasmin Rice at Reishunger.de and save 10% with my discount code “reislaura10” (affiliate link). In a small pan combine the coconut cream (250ml), palm sugar (2 tsp) and a pinch of salt and bring to a simmer at low heat. Cook while stirring often, until the sauce has thickened. Then remove from the heat. Warm up your leftover rice in the microwave. Pour half to 2/3 of the prepared coconut cream on the rice and mix well. Cover and let it sit for 10-15 Minutes, the rice will absorb the cream. Peel and slice or cube your mango - not your fingers, please! 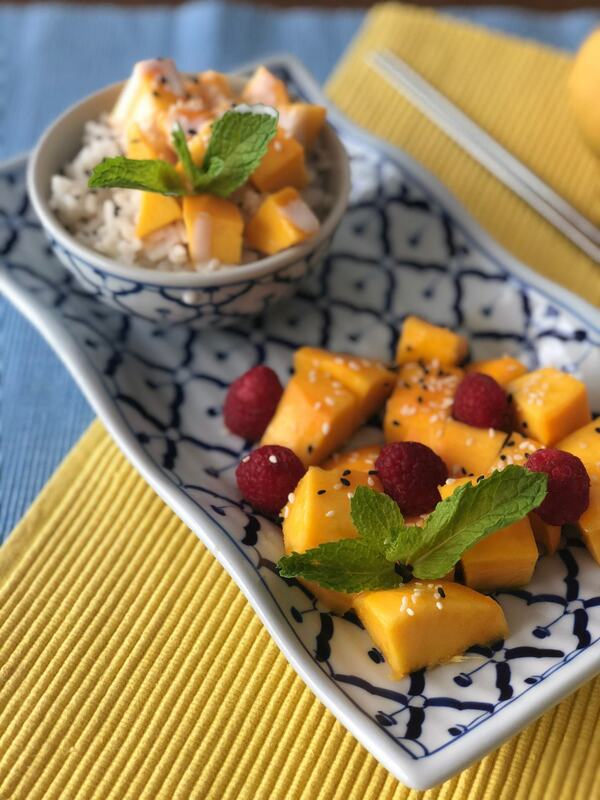 Place the rice in a nice bowl, top it with the mango (you'll probably need just half of it), pour some or all of the remaining coconut sauce on top, sprinkle with sesame seeds and decorate with mint leaves. Wie schön Isa! Genau dafür steht mein Blog: Speisen aus der Welt direkt zuhause und einfach vorbereiten! Lass es dir schmecken!